Experimental Station is grateful to CHIditarod Foundation for the opportunity to carry out our Crockpot Project. All who participated deemed it a lot of fun and a great success! The project goal was to provide a series of three crockpot cooking lessons to residents of the low-income Jackson Park Terrace (JPT) apartment complex. The crockpot was presented as a solution to the problem of lack of time at the end of the day to prepare a healthy meal. Additionally, the crockpot provides a solution for those who may lack cooking utensils or a functioning stove on which to prepare hot and healthy meals. Those participants (up to 25) who completed the three-class series would receive their own crockpot, a knife and two cutting boards (one for fruits and vegetables and one for meats). Two Experimental Station staff members were central to the project: our 61 st Street Farmers Market Manager, who coordinated the project, and our Finance Administrator (an avid crockpot user), who was our Chef Instructor, providing the crockpot class instruction. Coordinating with the JPT apartments management staff, the 61 st Street Farmers Market Manager secured the JPT community kitchen to hold the cooking classes, which were scheduled for Wednesday, January 25, February 1 and February 8. Our Market Manager purchased 25 crockpots, 25 knives and 51 cutting boards for the project. With outreach assistance from JPT management, 22 very enthusiastic participants signed up for the classes, where they learned how to prepare 7 different recipes. The January 25 class taught participants how to prepare Beef Stew and White Bean Kale Soup. On February 1, they made Lentil Sloppy Joes and Vegetarian Enchiladas. 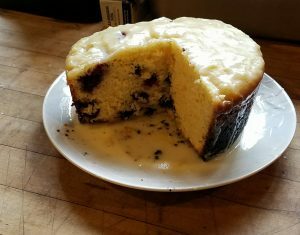 On February 8, dessert was on the menu, with participants learning to use their crockpot to bake Apple Sharlotka and a Lemon Blueberry Cake. They also learned to prepare Overnight Oatmeal. Following the February 8 class, 20 excited and very lively participants received their crockpot, knife and cutting boards. Class members also received a small recipe book, created by the Market Manager and Chef Instructor containing all of the recipes taught in the class. As two of the class members had not been able to attend all three classes, the Market Manager and instructor held a make-up class to ensure that everyone received a crockpot. One participant had made a whole meal for her neighbors just with her crockpot. One participant gave her old crockpot to her daughter and kept the new one so that they can ‘crockpot’ together. One participant was excited to have cooked an entire roast in her crockpot. A number of participants were using recipes from the class recipe book. One woman came to the farmers market to purchase ingredients for her crockpot. Several participants asked about growing their own vegetables in the resident garden plots, maintained by Experimental Station. We will work with them this summer to help them do so! All participants enjoyed the experience and asked to continue the relationship with Experimental Station around their crockpots! 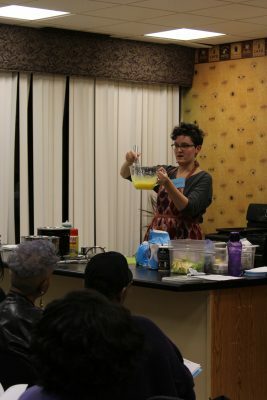 As a result of the success of the Crockpot Project, Experimental Station will be developing additional cooking classes—including crockpot cooking—for the Jackson Park Terrace residents. Again, we are grateful to CHIditarod Foundation for providing the opportunity to undertake this pilot project.